Take the Misfits, KISS, Alice Cooper and a bit of Rob Zombie and the Murderdolls are what you get: a horror punk outfit with a campy B-movie sense of humor and some glam influences. The band initially was a combination of members from Slipknot (Jordison), Static-X (Eisen) and Wednesday 13 who had previously sung for another horror punk band called Frankenstein Drag Queens From Planet 13. Eisen left not too long after recording and in came Eric Griffin (bass), Acey Slade (guitar) and Ben Graves (drums) to complete the band. 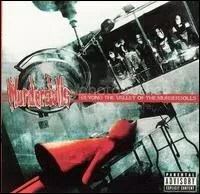 I think it was one of my friends up in Virginia who suggested this album to me, but I remember one of the local rock stations giving this album some hype as well thanks to the Slipknot connection. As I’ve stated before, punk isn’t a favorite of mine, but like the Misfits, this band pulls in enough humor & B-horror movie lyrics to hold my interest. The music is good, but the real interesting part is the lyrics. The zombie classic Dawn of the Dead, Twisted Sister and even Dee Snider’s Strangeland horror film all get mentions. The band was only active for two years before Jordison heard the call of Slipknot once more, though Jordison & Wednesday both claim the Murderdolls will walk the earth again some day.